Thank goodness my health and nutrition are on point as it’s been a tough week with Cherry in China attending a funeral. Thank you to everyone sending in your condolences. No sorries are needed. Grandma Chan is leaving behind a successful legacy. Much of her family evaded Communist China, her grandkids are all quite successful, and her great grandkids (my kids) are on a good path while living in the greatest country in the world, during the best time in history to be alive. RIP Grandma Chan, we honour you in our efforts to make this a better world for everyone around us. Another tough week is upon us as we approach Thanksgiving where we as the Hamilton Basket Brigade will spend $20,000 on what has become a birthday party for 40 of Hamilton’s most underprivileged families. I am the co-founder and President of our registered charity on a mission to relieve poverty and be the change I want to see in the world. The local elementary school boards support us by contacting the families and having the families fill out wish lists. Here is what one Hamilton school administrator wrote about one of the families we are supporting on Oct 6th and this Christmas as well. “We have definitely kept our eye on this child and have helped where we can. Last year our principal got some outside help for this student during the Christmas season and the family was very grateful as they were unable to provide. The slogan for the Hamilton Basket Brigade is “be the change,” a shortened version of the famous Mahatma Gandhi quote. Gandhi may not approve, but come hell or high water, we will be the change for this family and 39 others this Thanksgiving. Thanks to all the listeners who are donors and volunteers. Volunteers, I’ll see you Saturday for what has proven to be our most challenging event, and hopefully the most rewarding. You as the CEO of your life and business. If you were to take a third person view, say as the chairman, and have a look at the CEO you have employed to run your life and business, would you want them to have high energy and eat a healthy diet or would you want someone sluggish who considered french fries a vegetable? In masterminding with many entrepreneurs, health and weight are concerns for many, as they should be. 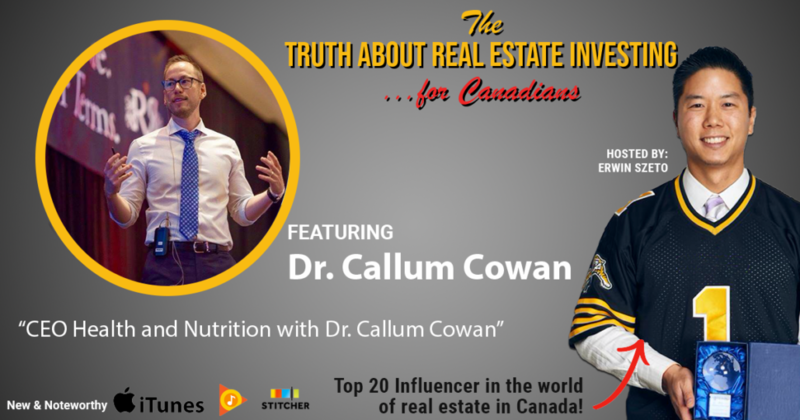 Much of your health and weight depend on your inputs, meaning what you eat, and here to help us all with what the heck we should be eating, is my performance doctor, Dr. Callum Cowan. If you follow him on Instagram (@phenom_doc), you’ll notice his patients include many elite athletes, whether Canadian Olympians, or NHL’ers (such as local Hamilton boy and defenceman for the Nashville Predators, Ryan Ellis) and UFC Champion, Max Holloway. Dr Cowan answers my millions of questions on what to eat vs. not to eat: e.g. coffee, chocolate, a glass of wine a day, most science backed optimum diet, the fastest path to gaining more energy and health. If you don’t believe in functional medicine, that’s cool too, I just know I’ve gone from needing regular naps in afternoons to having the best mental clarity I’ve ever had. I’m pushing new personal bests in the weight room, my abs are popping, and I know I could beat up any previous version of me. I’m not looking to impress, but rather share my results from my lifestyle changes. If you hear me mention Tom, that’s my friend, mentor, gym buddy Tom Karadza, co-owner of Rock Star Real Estate. He’s the one who introduced me to Dr. Cowan. Anyways, without further ado, Dr Callum Cowan.